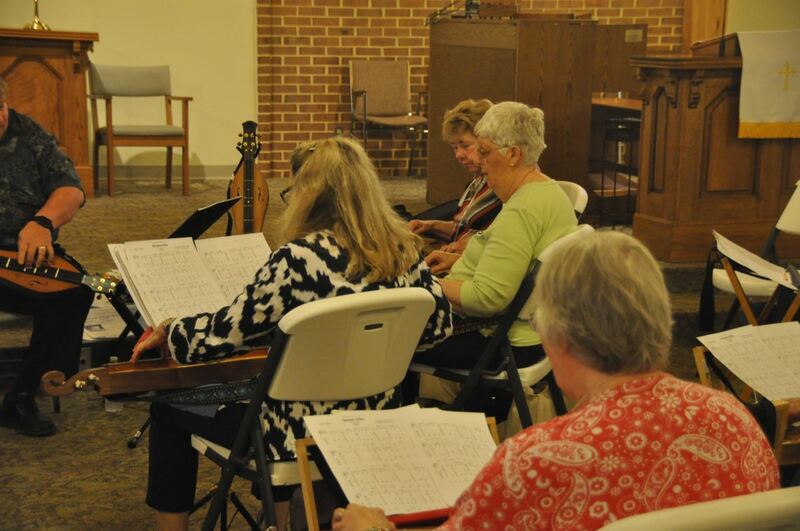 Dulcimer Master Bing Futch Returns to Nellysford to lead workshops on May 4! Many folks will remember the wonderful concert Bing Futch gave us in 2018. We’re delighted that he’s planning a return visit on May 4. A dynamic and entertaining performer, Bing has become a nationally known musician. 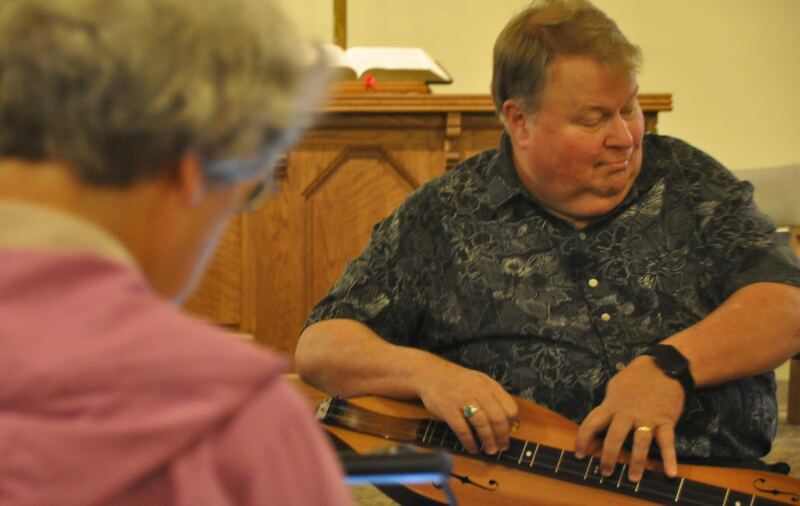 Although the mountain dulcimer is his principal instrument, Bing often incorporates the Native American flute and the ukulele into his programs as well. When he’s not on the road making and teaching music, Bing and his wife, Jae, live in Florida – but he’s gone a lot. Travels during 2019 are taking him to Michigan, Indiana and Illinois, as well as many sites closer to home. And on his way between festivals in Pennsylvania and appearances back home in Florida, he’s making a stop here in Afton and Nellysford. Bing’s concert will be in Rockfish Valley Community Center on Saturday, May 4, at 7 p.m. Cost is $15 per person for general admission; and $10 per person for RVCC or BRMDP members. The address for RVCC is 190 Rockfish School Lane, Afton, VA 22920. Some of his recordings will be available for purchase if desired. Plan to be there! You won’t regret it. Some of Bing’s Music clips: http://www.bingfutch.com/musicandvideo of May 4 at 7 pm. Tull Glazner Workshop planned for September 21! Please refer to the items on the pull down menu for the most recent updates! Our upcoming jams are listed here (view here). 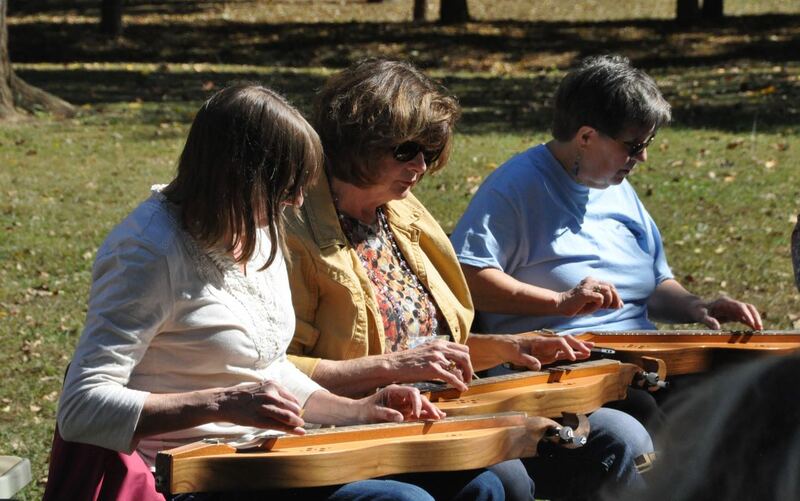 Galax Dulcimer/Melton Family Tradition – “Galax Style” is the term given to cover a type of dulcimer and a style of playing from the southwestern area of the state of Virginia, in particular the playing of one family in and around the area of Galax – the Meltons. This dulcimer style dates back to the mid-1800s and is one of the oldest in the history of mountain dulcimers predating the dulcimer revival which started around the 1960s. 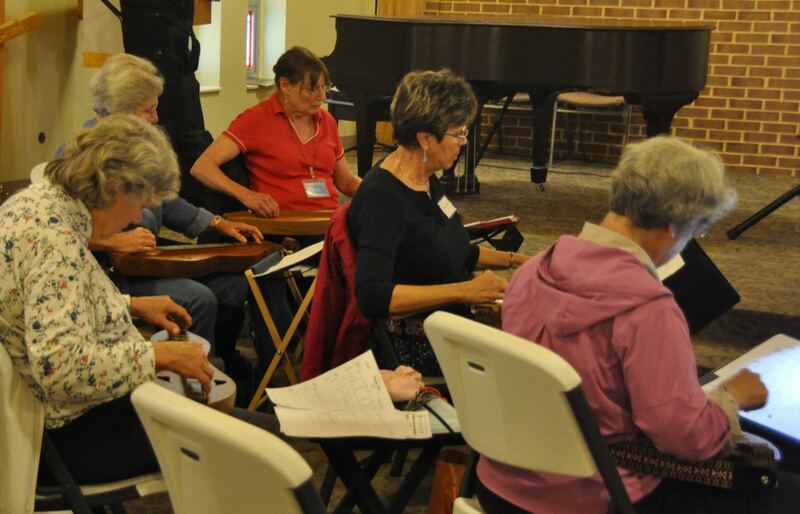 On October 30, 2018, Bridgewater resident Phyllis Gaskins shared her story of how she fell in love with the Galax Style dulcimer, and how it became her passion to preserve and share this style of music for generations to come. 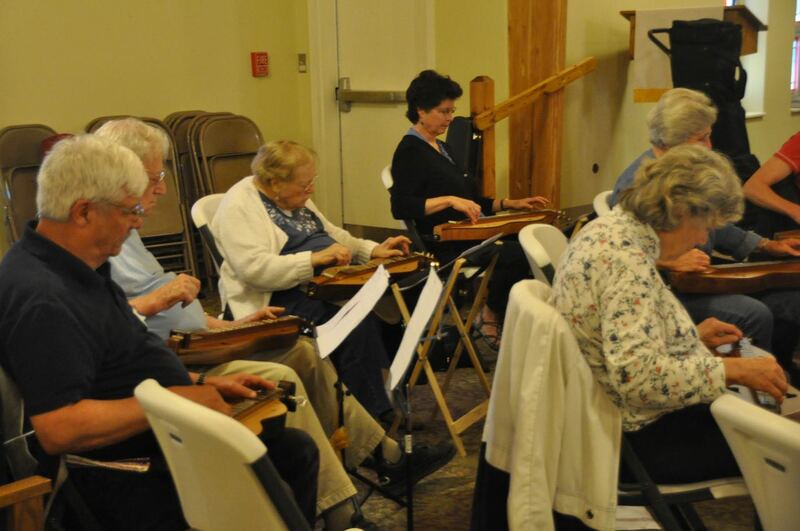 Phyllis brought her collection of Galax dulcimers, and presented a slide show of history, and making of the instrument. Phyllis is the ultimate authority on Galax duclimers and their history, though that is nothing that she set out to do! So our club experienced a unique opportunity to learn first hand from the acknowledged expert! Here’s a couple pictures from our 2018 picnic. While disappointed that some folks who had planned on coming on the original date were not able to make it, we were delighted to have a good turnout for the slow jam, and, of course enjoyed the great food! 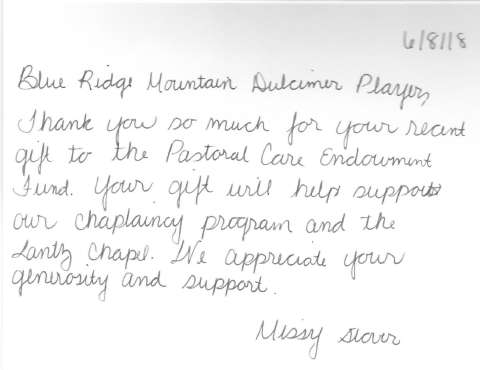 Thanks to all! 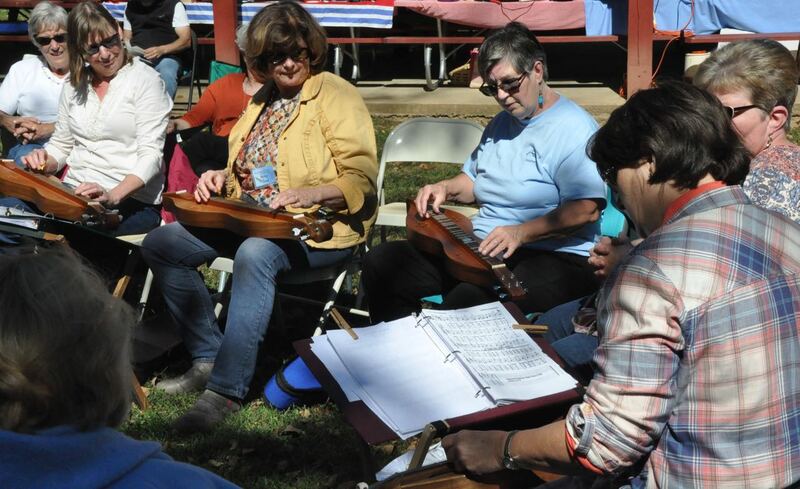 The Blue Ridge Mountain Dulcimer Players FALL PICNIC and JAM has been re-scheduled for September 22, due to the effects of Florence and the forecast for rain, flooding and high winds. 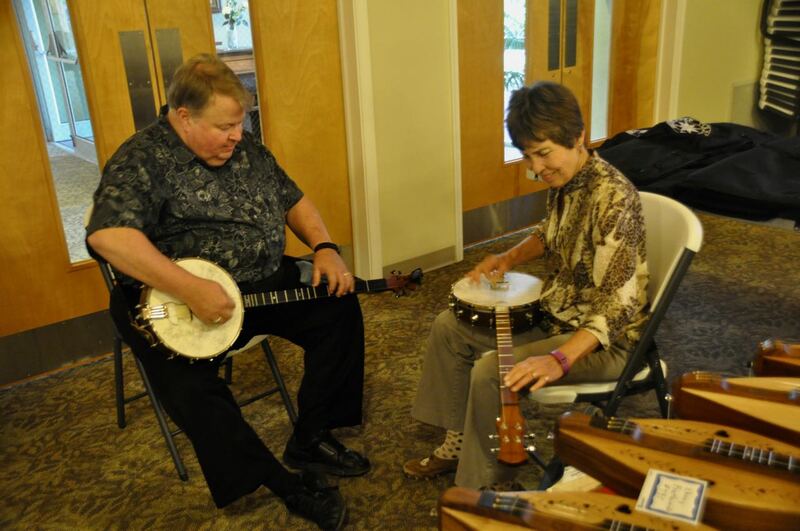 This will be our THIRD SATURDAY JAM, thus no jam is scheduled at Augusta Library, Sat. 15. Slow jam will begin at 11:00. Regular jam begins after lunch. 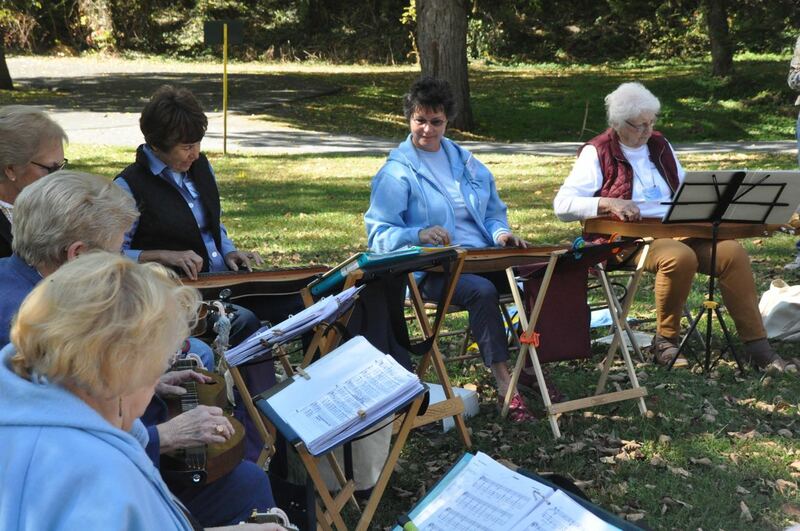 Bring your dulcimer, chair, and whatever you need for jamming! Gather at Shelter #4 (go straight when entering the park). 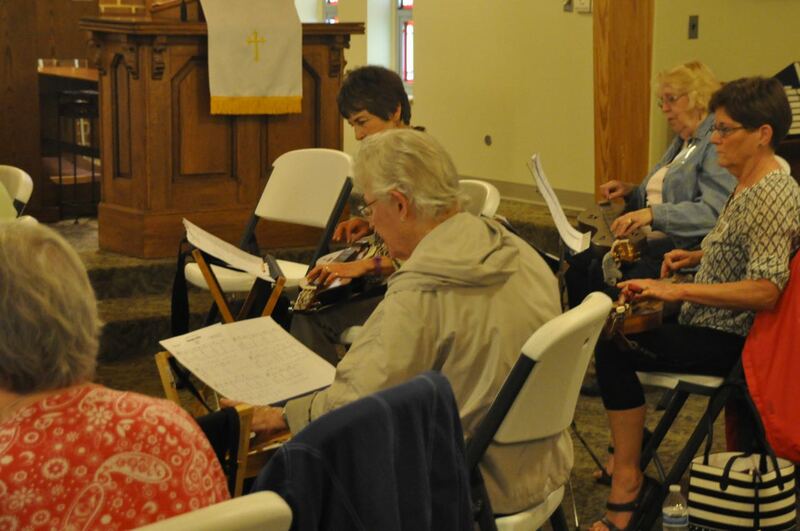 Bring your dulcimer and a chair for playing! 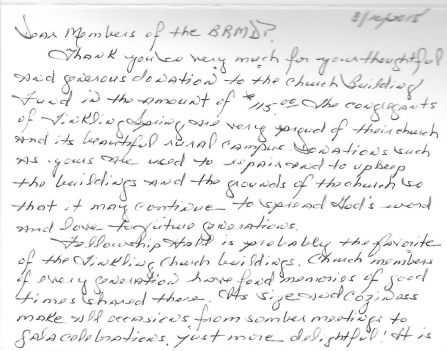 PLEASE RSVP by Saturday September 15 to Becky Chalam (or blueridgedulcimer@comcast.net) letting us know how many in your family will be coming. If you have already replied, but now will not be able to attend on Sept. 22, please drop Becky a note. Plan to arrive between 11 and noon, and set up for our picnic. A “slow jam” is planned between 11 and noon; we will “boil that cabbage” while food is getting set up! Consider this an “introduction to jamming” for newbies and a chance to play some slow tunes, for any who might find fast jam tunes daunting! 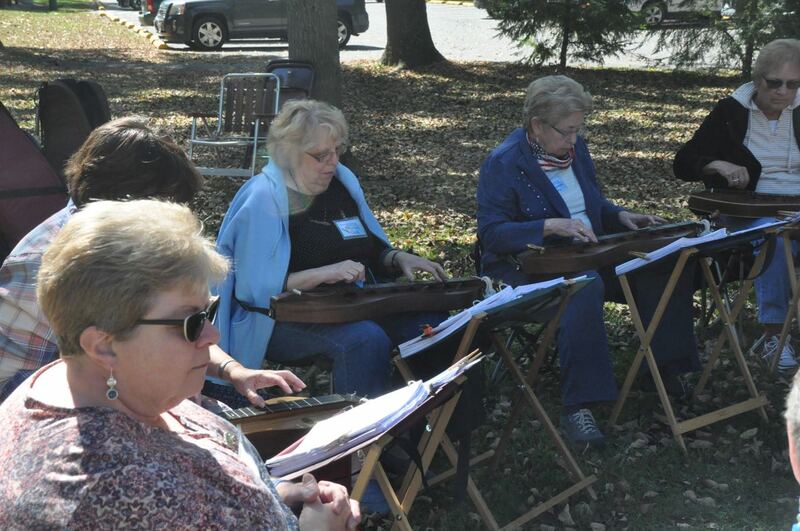 So, plan to bring your dulcimer and chair! Dinah Ansley will lead this jam; bring your Dave Haas Jam book. We have only two more jam books left at the special club price. 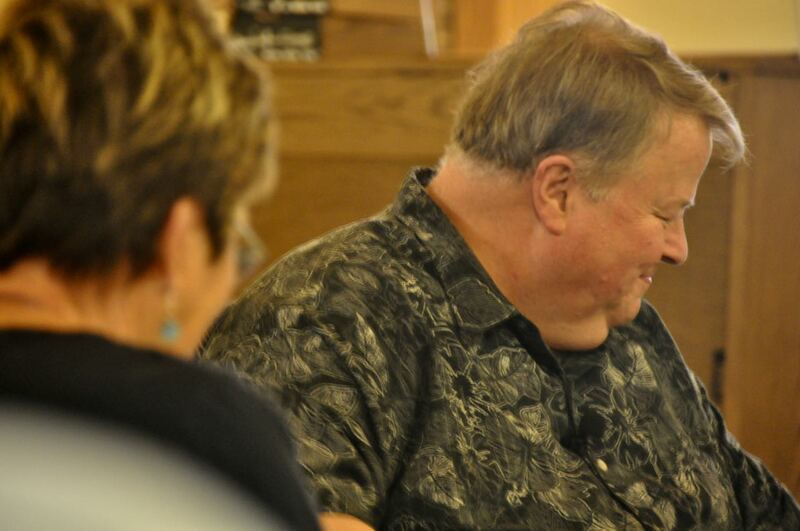 Lunch will be at noon – bring a dish to share, BBQ chicken will be provided by the club! –Bring a friend and family, too! Paper plates, plastic ware and water will be provided. We will continue with a jam after our meal, playing some of our usual jam favorites and a few faster tunes. (In the case of inclement weather, please check our Facebook Page or website for updates or cancellation information). Note: there will be no Jam held at the Fishersville Library on Sept. 15, 2018; as we will be jamming together at Grand Caverns Park in Grottoes, VA on Sept. 22! 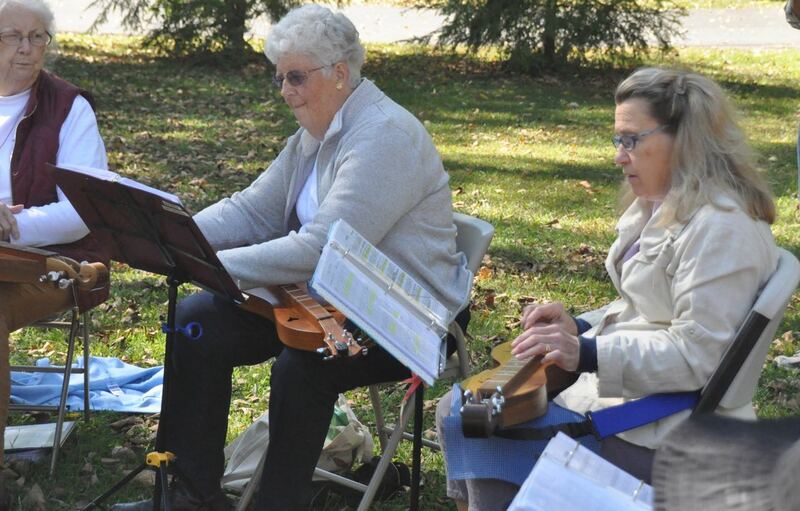 Last year, we enjoyed great fall weather, playing outside, visiting with old and new friends, and sampling great picnic fare! 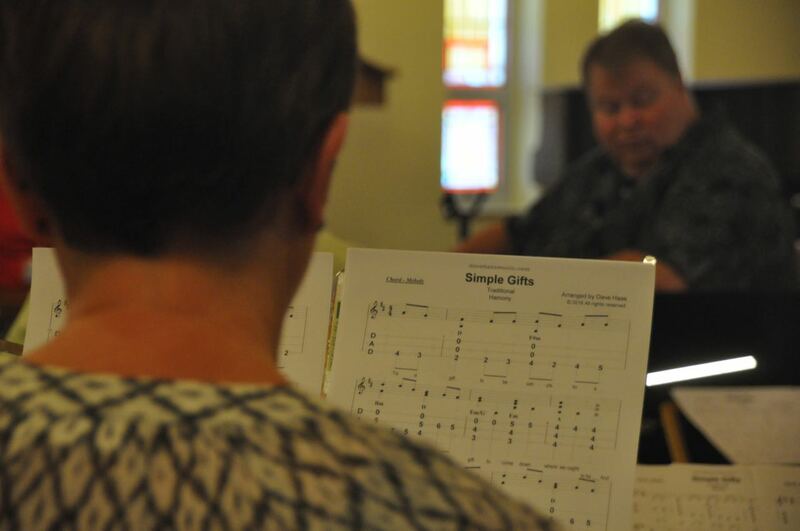 We had a great day Saturday, enjoying three workshops with Joe, sharing our bag lunches in the Fellowship Hall or out in the sunny weather by the Tinkling Spring. We enjoyed our evening meal supplied by club members and the visiting time it provided us. This before-supper photo included only those who stayed for supper. Somehow the day (and attendees!) slipped away before we snapped a photo will all our club members who were there! We’ll have to do better next workshop! 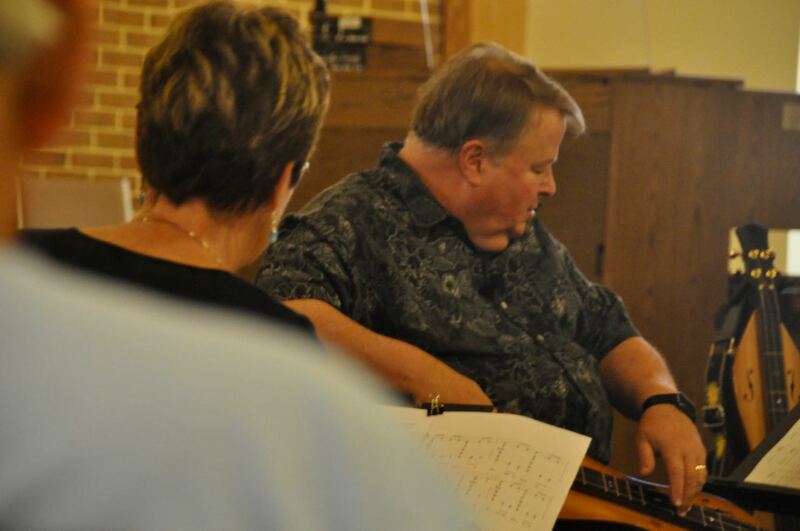 The 6:00 pm Evening Concert by Joe Collins was a delight and enjoyed by a good sized group! Thanks to all who came, participated and shared! 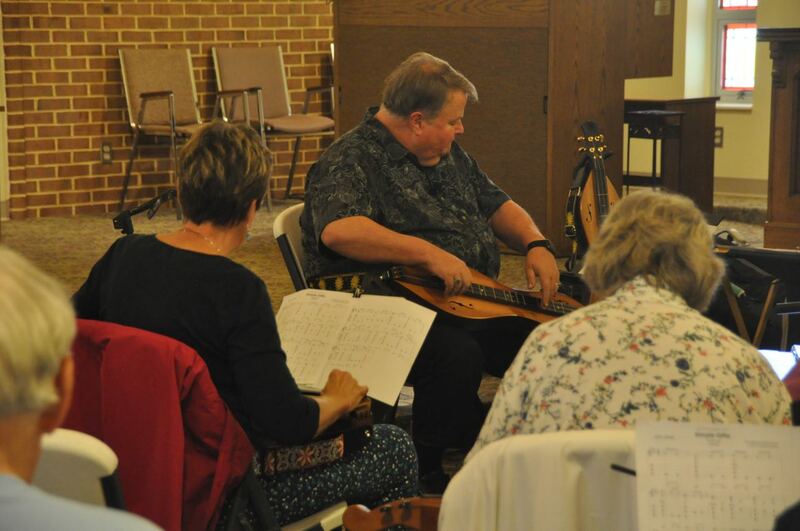 Joe Collins was winner of the National Mountain Dulcimer Championship in 2007 in Winfield, KS, in addition to numerous other awards! Over the past twenty years, he has had the opportunity to teach and play in festivals from California to the east coast, from Florida to Vermont, and a lot of places in between. 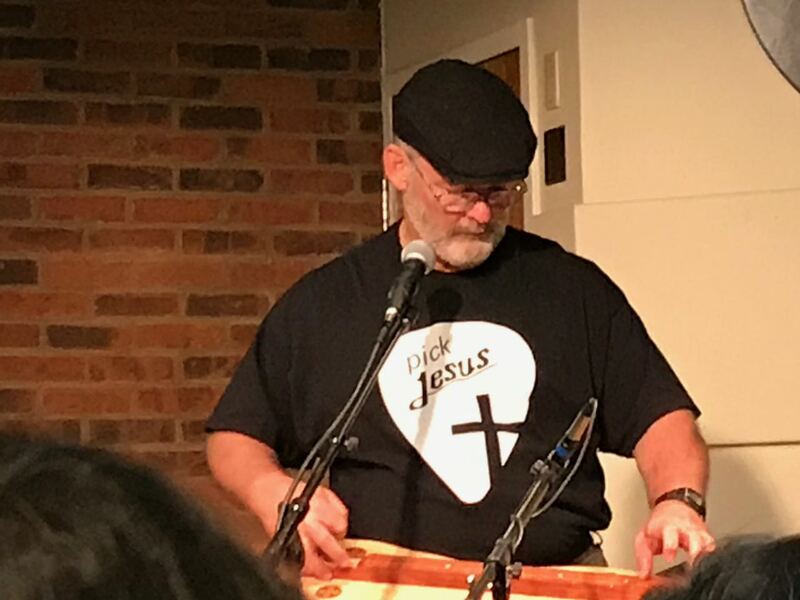 His performances are sprinkled with a lot of humor and some excellent mountain dulcimer playing – sure to bring a smile to audiences of all ages. 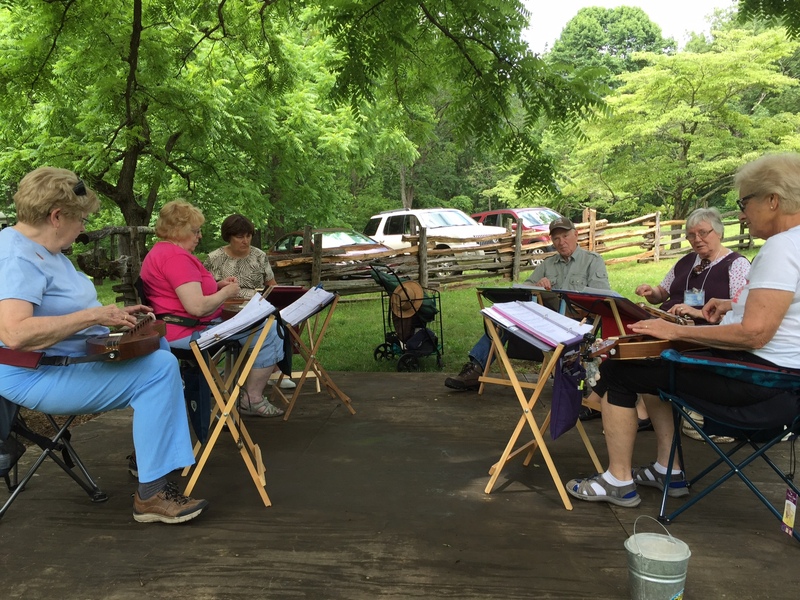 We hope you can come join us in a jam at the Humpback Rock Visitor Center on the Blue Ridge Parkway! 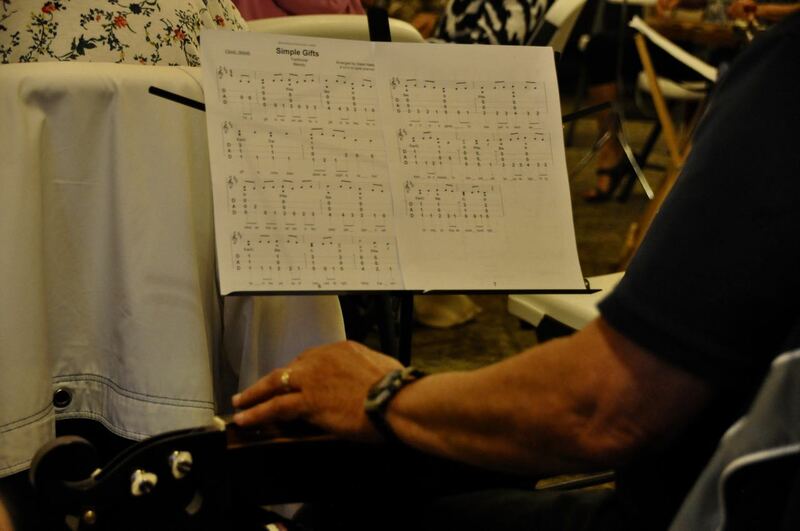 Club members will be playing from 2 – 4 pm on the 2nd and 4th Sundays of June, July, August, and September. If the weather is agreeable, October, too! 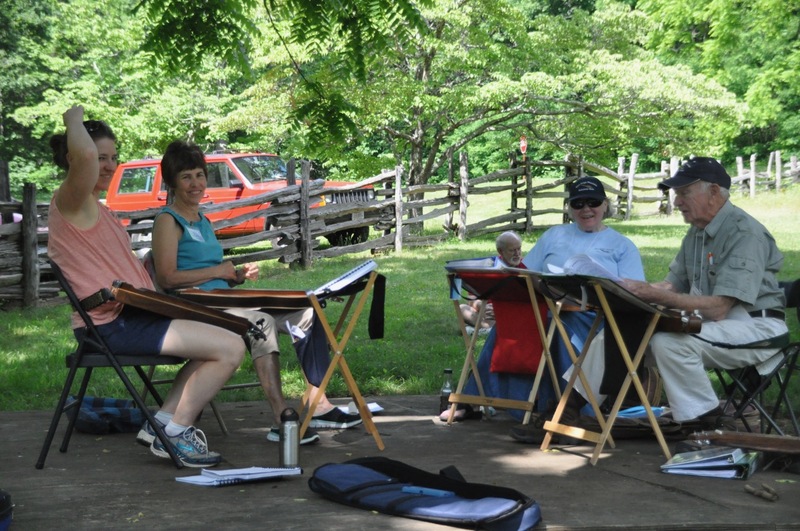 It’s always a fun way to spend time with the dulcimer community and to share our music with visitors to the Blue Ridge Parkway! 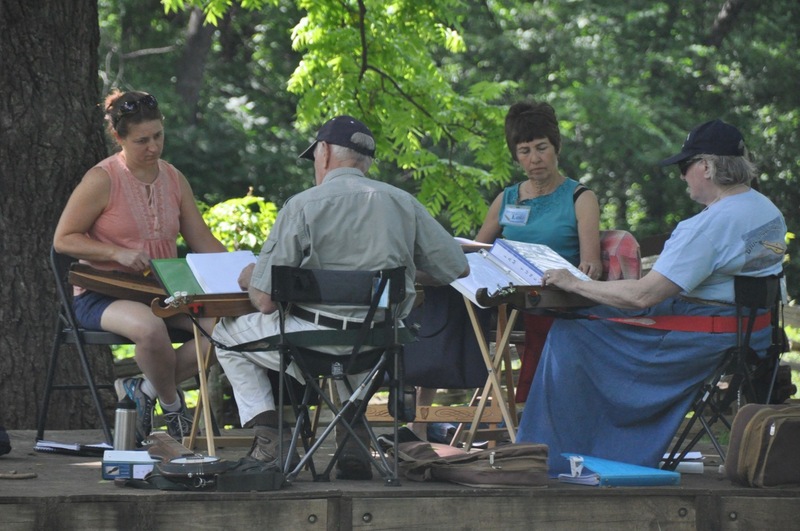 Bring your own chair – sometimes we play on the porch of the Joe Clark cabin right down the path, and sometimes we play on the platform under the big tree.